Convention continued with further budget debate. Delegates continued to move motions cutting budget lines to reduce the overall budget deficit. The Editors’ Weekend was eliminated for 2012, and the Provincial Women’s Committee, Provincial Human Rights Committee and the Provincial Young Workers Committee’s budgets were capped at $50,000 each. The Education budget was also reduced by 10 per cent. Interest and dividends from the Strike Fund were directed into the General Fund for this year. All other OPSEU committees had their budgets reduced by 10 per cent; this did not include caucuses. Local rebates have been reduced by 15 per cent for the next four rebates, and Executive Board Members are now limited to only being off work for 50 per cent of their total work hours. A proposal to eliminate the Local President’s time off fund was defeated. Had this passed it would have severly hurt our Local. As a result of the amendments, the budget moved from a deficit to showing a small surplus. Delegates passed the budget just prior to lunch. It was long and sometimes heated debate lasting almost two hours, the Temporary dues levy was defeated. It did not achieve the two-thirds majority needed to pass. Local 331 voted against the increase on behalf of our members. Debate on the budget has been delayed while the budget is amended to reflect the change in revenue. The 2012 OPSEU Annual Convention is now underway at the Metro Toronto Convention Centre with Local 331 having six delegates, 3 alternates, and 1 retiree in attendance. Thursday morning began with welcome speeches from Marie Clarke Walker from the Canadian Labour Congress, Toronto City Councillor Janet Davis and Tourism Toronto representative Denise Wiese. 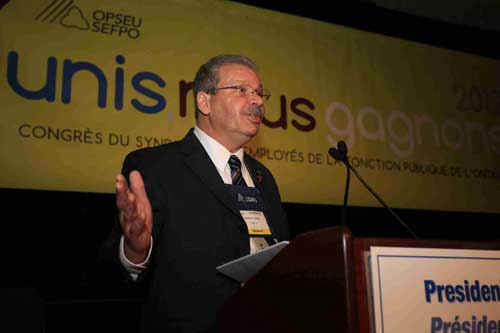 Wiese also presented a cheque to OPSEU’s Social Justice Fund in the amount of $10,000. President Smokey Thomas delivered his opening address to the members, and then delegates received a report on the union’s audited financial statements. Debate also began on giving official committee status to the Aboriginal Circle, and allowing electronic voting for local elections.